Welcome back to our second post in With a (Black) Gat! I don’t think that you can argue with the assertion that the Joe ‘Cap’ Shaw era was the highwater mark of Black Mask Magazine (and detective pulps in whole). 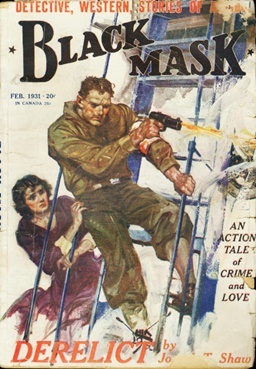 Some good writers, like Steve Fisher, Cornell Woolrich and John D. MacDonald, made their marks on the Mask with Shaw’s editorial successors, but let’s be real. Dashiell Hammett and Raymond Chandler are recognized as the two greatest Black Maskers, though Chandler only wrote eleven stories over three years. It was his novels (the first two drawing heavily on his Black Mask short stories) that launched him to legendary status. Carroll John Daly, creator of Race Williams, was the most popular writer in the stable, though Shaw disliked his work. Erle Stanley Gardner (better remembered for Perry Mason, though his Cool and Lam stories are great) was one of the favored sons. Frederic Nebel, Shaw’s handpicked successor to replace Dash when he left the pulp field, belongs in the upper echelon. As does the less-well remembered Raoul Whitfield. And today’s gat is in Whitfield’s hand. Boy, did he like to use one! 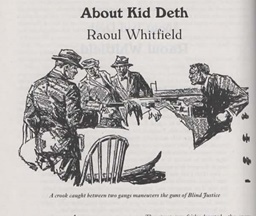 “About Kid Deth” appeared in the February, 1931 issue of Black Mask. Raymond Chandler famously said, “When in doubt, have a man come through a door with a gun in his hand.” Chandler may very well have developed this axiom by reading Whitfield’s story. I’m kidding! Joey ‘Kid’ Deth never shoots a gun. But pretty much everybody else does in this story of a crook caught between two gangs and trying to escape a police frame. In twenty-two pages, there are, by my count, eight shootings (well, one guy starts the story dead from a gunshot); nine if you count more than one person shooting at Deth. Whitfield absolutely keeps the story moving with more gunplay. In fact, I don’t recall anyone using a guy with a gun to advance the story as frequently as Whitfield does in this one. “Why not? Gray and the Nassers – they tried to frame me. I never hurt them. And when you started to jump me – all of you started to quit or squeal. You were tipping Charlie off, Mac – you knew he was coming here. Old Andy, he got yellow when I made him talk. Even the dicks – Sarlow is after me. You all want to see me burn – because a burned guy don’t talk. But Charlie here – he’s not too anxious for me to get inside Headquarters.” That’s seven dashes in nine sentences. There are three dashes in the next paragraph of five sentences. I’d count all the dashes on one page, but even though I’m the Fiscal Officer for a government agency with a $50 million budget, I’m not sure I can go that high! I don’t find it distracting, but it’s certainly distinctive and I could see it bothering some readers. It’s nowhere near as common in the author’s Jo Gar stories, which he wrote under the name of Ramon Decolta. The story opens with Deth snagged by a cop near the corpse of a rival. And the cop immediately sets up a frame. Things look bad for Deth, until some guys with guns come on the scene. A rather breakneck pace, which constantly sees Deth moving forward and more guns entering the story. This pretty much continues until the final confrontation. This isn’t a great story, though I enjoyed reading it. It’s tough to get the cover, even if you have two stories in that issue, when Cap Shaw has a story in it! Gar carries a Colt automatic and doesn’t mind using it, but to me, his manner and tone bring to mind Agatha Christie’s Belgian detective, Hercule Poirot. He seems a bit particular and soft spoken. And he’s not physically imposing. If Poirot carried a gat and didn’t mind looking for trouble, I think he’d be a bit like Gar. But rest assured, Gar does not play with his moustache and talk about little gray cells. The more Gar stories I read, the more he becomes a favorite. Whitfield holds the distinction of writing the first Hollywood PI novel – Death in a Bowl (a three-part serial for Black Mask in 1930). 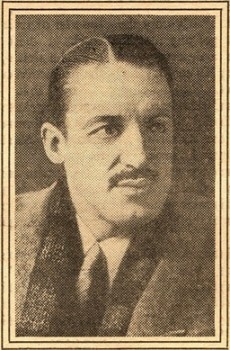 Whitfield, who came of the Carnegie line and was handsome enough to appear in silent films, married a Vanderbilt in 1933. But his marriage and his writing career quickly fell apart. She killed herself in 1935 amidst divorce proceedings and Whitfield inherited her fortune (that’s got the makings of a Ross D. MacDonald story…). He was effectively done as an author and he contracted tuberculosis, dying in 1945, broke. Hammett, learning of his woes, wired money to pay his hospital bill. Whitfield cranked out words at a pace that makes one think of Erle Stanley Gardner. In 1931, he published 18 stories in Black Mask alone! Because he produced stories at such a hurried pace, some were too formulaic, and some was simply not that good. But when it worked, Whitfield was one of the best of the early hard-boiled practitioners, and he is rightfully considered one of The Black Mask Boys. West of Guam: The Complete Cases of Jo Gar, from Altus Press, contains all Whitfield’s stories about his Filipino detective. If you want to check out some Whitfield, I think that’s a pretty good place to start. I’ve not yet read Death in a Bowl, but it’s on my ever-growing list. The Black Lizard Big Book of Pulp Stories includes “About Kid Deth.” The six linked stories that form Rainbow Diamonds can be found in The Black Lizard Big Book of Black Mask Stories. That huge tome also includes “Murder in the Ring,” a Whitfield boxing story. Whitfield stories also appear in other quality anthologies I own: Hard-Boiled (Pronzini/Adrian), The Black Mask Boys (Nolan) and Tough Guys & Dangerous Dames (Weinberg/Dziemianowicz/Greenberg). Wonderful. I really like the Jo Gar stories a lot, both the linked ones and all the others, it’s my favorite Whitfield. That Altus Press collection of the stories is worth it’s weight in gold. I dipped into it all last Summer, and wish I could read it new and fresh again this year, but I’m on to Race Williams starting next month. R.K. – Thanks! I’ve only read a couple of Gar short stories in some anthologies, but I’ve REALLY liked them. I’ve got the Altus Press collection in my cart for my next purchase. I also just picked up Whitfield’s first novel, ‘Green Ice’ via kindle unlimited, so I’m going to check that out. I like him more than I used to, but I’ve got mixed feelings about Race Williams. I’ve got a review copy of the first Altus Press collection that I need to dig into for a future ‘Gat’ post. A bit of a hue and cry rose from old school hardboiled fans when it was revealed that Whitfield’s connected chain of short stories, The Rainbow Diamonds was going to be published in The Black Lizard Big Book of Black Mask Stories. I don’t believe it had ever been previously collected. I enjoyed it but, like most of Whitfield’s work, it didn’t knock me over. At times his style grows so terse that it starts to feel a bit sketchy to me. The author deserves plenty of cred for creating Jo Gar, though. This detective is not a big white guy. He’s a small brown guy who’s polite, methodical, startlingly effective when endangered, and always the smartest guy in the room. The pulps didn’t have another like him. I enjoyed Whitfield’s well-esteemed first novel, Green Ice. It’s transparently a ‘fix-up’ of a number of short stories that appeared in Black Mask but it has a good deal of memorable Hammett-influenced prose. Death in a Bowl is good but has so many prototypical Hollywood Detective Story elements that I almost felt I’d read it already. A lot of stories from the pulps have that effect though, as those old magazines were the forge of a staggering amount of modern storytelling tropes. Chris – I was pretty pleased with The Rainbow Diamonds. Not necessarily for the story, but because I love Jo Gar’s character. He really does make me think of a hard boiled Poirot. I think I’ve done myself a disservice in not searching out the Gar collection earlier. I plan on reading Green Ice soon. I find myself comparing Whitfield’s writing style to Frederick Nebel’s. And I think I prefer Nebel – though both were certainly in the Hammett school. Though not nearly as polished. I’d like to read Death in a Bowl. Chris – Was Whitfield one of the first to use those Hollywood detective story elements? If so, that would make me more admire the book. That is, he was coming up with enduring aspects for that type of story.